Yeah I get it. It's easy to knock a man when he's down. No sweat. I'm a man. I can take it. Just give me 3 more weeks to see how much I can improve from my original 44 wr. That will be the real bar. Edited by BIueMax, 30 July 2018 - 10:06 PM. It really does show that you're playing differently than you used to, your ratios are all shuffled up. Hit rate's down, damage ratio's down, but KDR and survival % are both higher, which shows smarter late-game play. Truly, kudos. Now, we're talking about a 5% change from your overall, which isn't spectacular, but it's a start. I think you're on the right track, but it's gonna be a very long road for 65% and 2500 average damage. A more important datum OP should be recording, is how much he enjoys/disenjoys the game, while playing in this mode. What good does it do him to improve his stats, if he ends up actually enjoying the game less? Out all the battles, I only recognized one player that I though was really exceptional. Now it does have to do with sample size as we were in back to back battles. Don’t get me wrong there was other great players, but I didn’t get the up close sample size. He had back to back + 4000 and + 5000. I was the next highest in the +5000 with a meager 1900. Again probably only due to sample size. Defaultz is really good and has been for some time now. His tier 10s are uniformly excellent. Good luck with your challenge and keep up the good work. Edited by NaDa_22, 30 July 2018 - 10:56 PM. He lurks the forums from time to time as well, I believe. He does. He is not a big fan of TDs and 183s, but who is fan of them these days. Large guns have an appeal because they can change the battle more without having to do as much, which I totally understand, but at the same time it seems to make tier 10 skill vs. 380mm of HEAT pen. 183's are just a problem. It should have been higher, but I made the mistake of playing a huge quantity of games in one sitting and playing through losing streaks (I always play through streaks and have never stopped, but I’ll try the 3 in a row rule going forward). I think the volume diluted the quality of play a little bit. Not trying to make excuses, but I noticed my stats were dropping during the weekend. Edited by ___ez_e___, 30 July 2018 - 11:21 PM. I Stink!!! Lol But, I am definitely learning a lot a lot a lot. Hey, I don’t shy away from a challenge and if after 30 days I don’t even start coming close to or do not show material improvements, then I’m man enough to apologies and say I’m wrong it’s not so easy to analytically get better at the game. I do still believe I can get to those stats, but I’m not sure if I personally can turn it around in 3 more weeks. I can say that I originally started like most noobs at low 40 wr and had to learn to get to the playing ability I have currently. This challenge has definitely made me take my gaming more seriously, then I ever have. Lol. Ok, so far it hasn’t gone as well as planned however I do know where some of my weaknesses and issues are that need to be fixed. Hopefully, someone can point me in the right direction. 30 Days – 9 battles, 44.44% WR, 1711 dmg, 33% survival ( I should have kept my other stats, but I will for this). Stats improved slightly, but for me I’m just finally regularly playing tier X so I realize I’m still learning a lot and will continue to learn. Before I took the tier 10 challenge, I would typically play maybe one or two tier 10 battles per week at most. I can’t believe how many times I go to what I think is the front line then take one shot and before I can say “boom” all of my teammates have cut and run for no reason other then to run away and hide, so they can’t get hit. I didn’t expect this to happen this much, but it happens way too much and more so then any other tier. So as a heavy, I have to be ready to cut and run way more. I've probably had my lowest damage and worst losses when this happens. 2. Supremacy seems to be the easiest way to lose. I’ve had teams yolo cap, then I’m stuck running away from enemy tanking taking pot shots at them until either I die from being chased down or lose by cap timer. So frustrating. What does someone recommend in dealing with this specific issue? Is the best you can hope for is damage farm it out? 3. I can’t seem to generate the pen needed for the dmp consistently!!! This is the most frustrating. When I’m up against a T110E4, Maus, E100, or even an E75 I can have games where I’m literally the last to die and I feel like I’m playing it right. Bounce after bounce I end up with crap DMG of around 1500ish when this happens. I main use AP, but I will use HEAT for these particular tanks if necessary. Is my ammo selection poor? Should I be using HE more then I do? I need to figure this out to actually get the useable dmg by penning. I don’t know the best spots on every map to be effective. Certain maps I feel very comfortable using, because I have some good spots for the T110E5. Other maps, I just don’t know where is the best locations for this tank. Like lower tiers, I can look at the loadup screen and view the matchups and predict how the battle will go, however certain heavy matchups definitely give pen issues more then other match ups. 6. Don’t help other tanks. 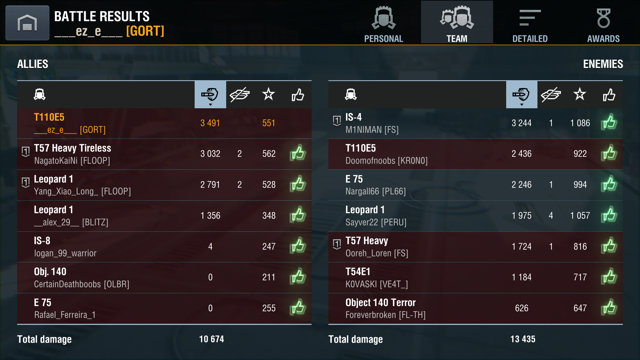 I normally don’t help other tanks, but from forum I saw the thread about losing the one tank. So I would see a tank yolo and then I would stupidly go there to try and “save” them so we wouldn't be down the tank count. I thought, hey maybe I can convince them to come back. Stupid. It’s already too late by the time I move and it’s put me out of position. 7. Rise to the occasion player. That’s me. I’ve had my best games by far against high profile players and I’ve had some really bad games against no name no clan players. I’ve got to keep my mindset even and don’t take enemies for granted. This is a bad habit I need to fix. Figure out how to generate more pen from shots. Attempt to get at least one more hit per battle increase in the stats. Stop after 3 losses in a row. I normally never stop for any losses, but I will now start stop playing after 3 losses in a row. See how that changes it. How long do you usually wait? I'll add battle screens later. I do not play my E5 like a heavy anymore - if the team splits for supremacy - I’ll go with the Meds. As you stated keep hull down as much as you can. It doesn’t have a ton of mobility to get out of spots if red pushes and your team flakes out. I went 6/9 today in X (cottage WiFi has me not pushing my luck for a lot of games). 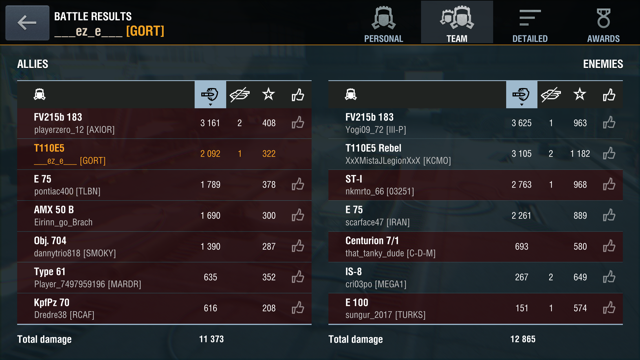 I lagged out badly in one loss in my T-62A, and it should have been an easy win, but instead of ducking behind a rail car I spun around in the A cap for red to rush me 3:1. One note - if you see a red SU, think where we he go? If you can deny him dmg, your team will have a much better chance. *and if they are playing an auto loader, ambushing when they are on reload is a very viable strategy. 1) You hit the hulldown aspect - don’t go anywhere you may be isolated - unless it’s cutting off a autoloader on reload. Your E5 is still a heavium, use your tank where you can abuse meds hulldown if you can - or flanks of the super heavies. 2) Supremacy in X is hit and miss, so often folks try to pull a ‘meta’ Strategy without looking at lineups - if you and a AMX 50 B are the only heavies do not follow a town path against a Maus, E100 etc - get that 50 B to remember he’s not a heavy either. 3) With CS you can pen everything fairly decently with AP, and if you have issues, track them and keep the distance. 4) Maps: anywhere you can hide the hull... best advice is drive around training rooms and see how long it takes to get to positions of dominance - think like a med. I can share some stuff via discord if your on it. 5) Matchup: kill reds meds, on most maps the meds/BC’s are my concern, simply as the E5 can get to most decent spots before tanks you may have pen issues with. The slow tanks with big guns, you can trade distance with, and force them to expose lower plates to cone get you. 6) If I can save a green, I will. But never at the expense of myself. So I will take a hit for a low health green, but I won’t rush into the open to help an exposed green - unless I know there aren’t reds waiting. 7) Rise to the Occasion: I have an observation here, you may or may not like. Quite often better players will seek to victimize weaker reds - simply as it gets guns out of the game faster. The SU knows your in a good spot - so he will allow you to farm damage off his team if it is at a slower rate than his team wipes yours out. Often in that situation, you end up doing great damage, and losing I would guess. I get in that trap a lot and one of our Pramo guys explained what he did to me two games in a row. He wasn’t left twice with 2/:1’s against me - and as it was explained to me it wasn’t worth risking significant damage to dislodge me until the end, as my team was giving him (and his team) easy shots. Quite often you will need to move to a different spot to support your team better for a win, or tell your team to stop being ducks in the red teams shooting gallery (I usually have better luck moving than getting my team out of a killzone). I did the same with the Lowe, it's good to get a feel for the gun handling and ride that "self calibration" for a while. Don't jump around tanks. So far the only battle that I lost where I felt I was playing disciplined, however I assumed too much and made the wrong decision. I saw FLOOP platoon was flanking and so I had a choice. Do I go bridge with heavies or go with FLOOP. Well as you you can see the heavy group did 4 dmg to support me. I assumed too much as I didn’t expect that bad of a performance from teammates. Then I was just overrun since the heavy team collapsed. At that point FLOOP themselves had taken too much damage to be an effective threat. On hindsight I should have worked with FLOOP because at least 3 guns could have worked together to turn the tide of the battle. I think you 100% made the right call. That FLOOP toon can take care of itself. The best thing you can do to help them is to babysit the other 3 teammates and act as an anchor. 4 damage among 3 teammates means you encountered an unpredictable and totally unreasonable scenario. You would have lost even if you went with your toon most likely given that atrocious performance from those three doofi (plural of doofus? xD). EZ, shoot heat at the turret cheeks of E100 and Mauses when the turret is flat and pointed at you. AP should be able to pen the lower glacias of each no issues if it’s unangled. If the maus and e100 are wiggling, good luck penning the lower glacias of both with either ap or heat. Which is why heat through the cheeks when they’re facing you is the better option. If they’re not angled/wiggling, ap will pen the lower glacias. Ap through the sides too. I just realized my T110E5 just went over 50 % WR all time. It was my last tank under 50 wr. I can now say that every tank I owned is 50 wr or better. The last battle you showed, no matter which decision you made its very difficult to overcome 3 zeros on your team. It's possible to overcome at times, but the odds of succeeding are heavily stacked against you for sure in any such game scenario. I finally have received some down votes for military honors for the first time since I started playing. A few I deserve, but most I’m getting from teammates that I guess want me to yolo or something. So the battle below is Supremacy at Yamato Harbor. So 704 calls left towards C cap, I’m the only one to actually go there and I figure it’s the best hull down option. Everyone else on my team is at or near A cap. Some of my team started complaining to me to come over to A cap. The problem was the 183 driven by a Triari clan member was unspotted. I wasn’t gonna cross over and lose half my hp for nothing. Why do people not understand that if you see a td driven by a known clan member, he’s gonna get a good spot and get his shots off. So the AMX 50 B comes flying by me and promptly gets dinged by the 183. Then he prompt gets finished off since he had like 150 dmg left. So the AMX 50 B then spams down vote me. Lol. I knew my foolish team would fall to the 183 if they weren’t smart. I got at least 2 downvotes. I don’t think I deserved it here. Edited by ___ez_e___, 01 August 2018 - 01:25 PM. I admire your determination to attempt this. One thing to maybe think about is how much you're playing. Looking at your last 90 days vs your last 30, it seems you've gone from playing about 10 battles per day on average to more like 40. Personally I can only play for about an hour, or two at the outside, before I start getting tired and sloppy. Perhaps you don't experience that, but if you do then you might be better served to play a more usual amount and then spend time studying your replays and reflecting. Good luck! Dude that 50 B player on your team is awful. Every time I see them green, I figure that we have an AFK - I’m surprised they did some damage. MH is meaningless, I’ll spam 40%’ers to Town and take the downvote in order to get my team moving towards anywhere but town. Even if C wasn’t the best call on that map, it totally would have been correct for the team composition. Anyone going to A or B was going to be out classed by red heavies if they went town. The only tank that should have contemplated A/B was the 61 IF AND ONLY IF all the reds where spotted near/supporting C.
Watching you update this thread makes me glad I’m in cottage country till next week. Very true. I’m just being a stubborn old fool playing so much. It’s fun though. I have figures out what my biggest issue is in order to be successful in a T110E5. I am overall playing strategically correct, but I’m having difficulty generating pennable dmp. I have to figure out how to generate more pennable dmp against a greater cross section of enemy tanks. Some tanks are no issues, others I can struggle to get pennable dmp. I think fixing this issue will help me a lot. Note: I did purposely choose the T110E5 for this challenge, because I know that I’m weaker in it then the IS7. Edited by ___ez_e___, 01 August 2018 - 06:37 PM.